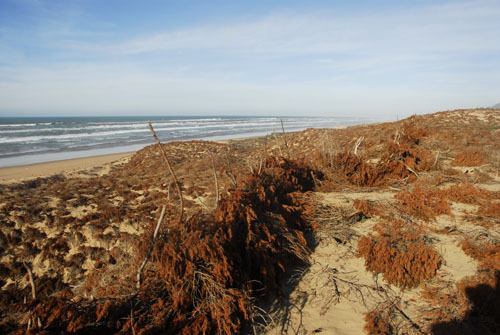 ..... the Administration des Eaux et Fôrets has tenaciously carried out a comprehensive program to fix and stabilise the dunes and to restore the dune forest. Systematic re-planting and the construction of three enormous artificial dunes were among the means used to prevent erosion and the instability of the dunes that arose from this historical deforestation. Since the 1960s, the construction of the lotissements has been causing remobilisation of the sands. The boulevard El Akaaba and the surrounding neighbourhoods suffer regularly from the sands of the shifting dunes. Controlling this fragile equilibrium between city and nature has always been and will always be one of the main challenges for the city of Essaouira. Maintaining the equilibrium between urban and natural spaces calls forward a number of priorities [ONEM 1996]. 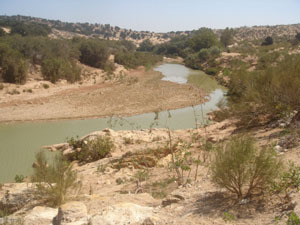 First among these priorities is the total protection of the valley of Oued Ksob as a zone non aedificande. The river delta and the bay form a continuous ecological landscape that encapsulates the city naturally on its western and southern sides. The bay and valley function as membranes that medi- ate respectively between ocean and city and dunes and city. The second priority is for the conception of a border for the city on its eastern and northern side, organising the transition between city and the dunes. The dune forest remains a vulnerable ecological structure. The heavy winds and the ongoing urbanisation in the dunes are the two main factors that jeopardise the ecological equilibrium of the dunes. It is imperative to safeguard the dunes. This protection of the dunes does not imply that they have to remain a non-space (as they have been perceived by the Essaouira population todate). Giving the dunes a specific use and significance for the city, while at first sight a contradiction, might be the best method of ensuring their protection. This can be achieved by creating a green belt around the city . Firstly, working on the equilibrium between nature and city concerns itself with the mediation between the city and the two majestic natural elements that surround it. How ever, this does not mean that nothing can be done in the city itself. Management of solid waste, sustainable water treatment and purification, and other environmental concerns have to be addressed and translated into programmes, actions and projects. 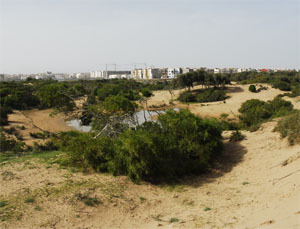 In spatial terms, the greening of a number of public spaces and the elaboration of the east west transverse connections acting as links between the two dominant natural elements (sea and dunes) is an important issue which, at the same time, articulates, clarifies and enriches the spatial structure of the city. From: Urban Development and Freshwater Resources. UNESCO, 1996. Updated for the CSI home page in February 1997.